Description: Best I could do. 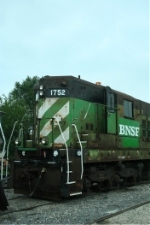 Description: Nose view of the BNSF 1752 an SD9. Description: BNSF 1752 sits dead along with 2 EX Santa Fe GP7's. I bet all three are heading to NREX soon. Description: An old BN SD9 sits in the Barstow yard with the L-427 local power. I bet the SD9 will held to NREX.